SERIOUS Investing: RHB-OSK: Will 2 ordinaries merge into 1 great bank? RHB-OSK: Will 2 ordinaries merge into 1 great bank? There is no doubt that the RHB-OSK merger is a great deal for OSK, at least on paper. Besides the RM174.3 million of net cash, OSK will end up holding 10% of the enlarged group, something for so many years having operated as a stockbroking concern is not bad at all. I have read that investors are not too happy with the valuation of 1.77x book value on OSK, hence probably the drop in the share price of OSK. Considering the fast deterioration on the future of retail stockbroking in Malaysia due to the country's inability to attract funds as well as large listings together with the thinning of commission, it is a deal which OSK will not walk away. 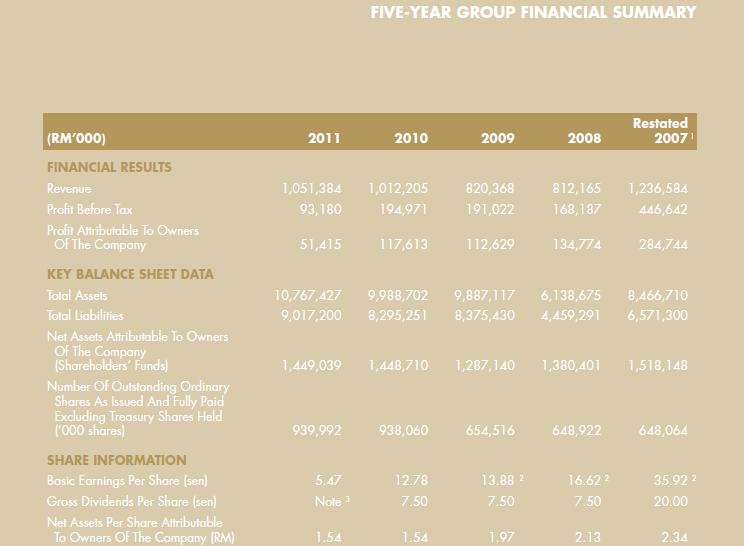 This is despite OSK still being the leading stockbroking house in Malaysia. Perhaps just for thought, let's look at OSK's last 5 years performance, we will understand. You will notice that revenue has somewhat tapered slowly but margin is the one that is thinning sharply. It is not due to OSK being a much lesser concern over the years but basically trading margin is deteriorating due to online trading and other newer types of competition. Stock broking is not lucrative anymore. One would say, what about investment banking. In Malaysia, if you are not CIMB or to a certain extent Maybank Investment, one should not even bother. What about RHB as a bank? After a series of mergers 10 or more years ago, it is today a bank that is not exciting but has somewhat stabilized. RHB today is a result of Kwong Yik, Sime Bank (UMBC), DCB Bank combined but unable to carry the combined dynamism. What is its strength today? I really could not think of any. It is not strong in retail, corporate - not particularly able to reach out to the middle working class or even the wealthy. It is a so so bank in every angle. By merging an average bank which in my eyes has no particular strategy with a deteriorating investment bank may not achieve anything. In business, if you are not great but somewhat stays in an attractive and ever changing industry landscape, you will be taken over. May not necessarily be a bad proposition sometimes for an investor. If you notice in Malaysia, we have slowed down the liberalisations of our financial industry. CIMB and Maybank over the past few years have gone out acquiring banks in our neighboring countries but we do not see this happening in Malaysia from other financial institutions. What we only see are new correspondence banks being setup or perhaps foreign banks allowed to increase their number of branches. This slow in liberalising the industry may draw flak (in fact already) from our neighboring countries and internationally as we do not reciprocate what other countries have allowed us to do. Do you really see Singaporean, Indonesian or Thai banks acquiring our financial institutions? The fact of the matter is that CIMB, Maybank or Public Bank for the matter can already compete on equal footing against any other overseas banks. Hence, I see that RHB Bank may become a candidate for takeover especially it is now owned by EPF. EPF will be able to put stabilisation effect to RHB but will not turn RHB into a dynamic organization. At its current Price to Book Value of 1.4x, RHB Capital is a very attractive concern especially for its branch and customer reach which any foreign concern would be attracted to. The fact of the matter is that this merger would not do much to turning the RHB Group into something special but perhaps give some additional impetus or dynamism to the retail stockbroking arm of RHB. In fact, as I see it over time, EPF may allow some dynamic organization to take over the banking concern. Much better this way. OSK at its current price of RM1.35 and market cap at RM1.3 billion seems to be attractive with the deal.